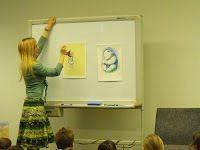 Emma Quay, author and illustrator was our special guest at Books & Bickies this term. Emma talked to the young crowd about how she works through the process of illustrating picture books. Emma has also written some of her own picture books and she delighted the kids by reading 3 of them to the crowd. The kids were the first to hear her new book, Rudie Nudie, which will be released in November this year. It was a wonderful afternoon and Emma delighted the kids with her beautiful drawings.